All infected or dead vines along with the root system are to be collected in a gunny bag, removed and burnt. After removal of the vine along with entire root system, the area to be drenched with copper oxychloride 0.2% (2 g/l) @ 5-8 litres to check the population build-up of the pathogen. Wherever water stagnation is a problem, effective drainage of both surface and sub-soil should be ensured. Runner shoots are to be pruned or tied back to vines before the onset of monsoon. With the onset of monsoon, the branches of live standards may be lopped off to allow penetration of sunlight and avoid build up of humidity. Apply 2 kg neem cake per vine per year in two splits both as pre and post-monsoon treatment, in disease prone areas. This would ensure build up of microbial load to suppress soil borne plant pathogen. After the receipt of a few monsoon showers (May-June), all vines may be given a foliar spray and drench the soil around the vines over aradius of 45-50 cm with potassium phosphonate 0.3% or metalaxyl – mancozeb 0.125% (1.25g/litre) @ of 2-5 litres per vine (pre-monsoon). This varies according to the age of the plant. A second spraying and drenching with potassium phosphonate 0.3% or metalaxyl-mancozeb 0.125% is to be repeated just before the northeast monsoon (postmonsoon). If the monsoon is prolonged, a third round of drenching may be given during October. For protection against fungal diseases, Trichoderma and Pseudomonas may be applied to all the vines at the rate of 50 g/vine (108 cfu /g) during May – June and again during August – September. They may be multiplied in cowdung medium in 1:50 proportion for 2 weeks and may be applied at the rate of 2 – 2.5 kg/vine. Pochonia chlamydosporia may also be applied during May-June and August September for protection against nematodes. Note: 1. 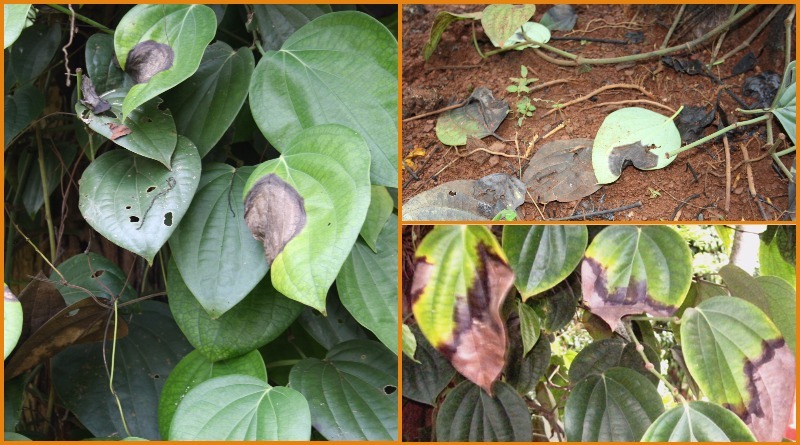 All chemical and biological control measures are prophylactic in nature and application of chemicals to vines in advanced stages of disease would be ineffective and hence removal of the affected vine is recommended. 2. Under high disease pressure biological control would be ineffective. Hence chemical control can be adopted to reduce disease to the minimum. Later biocontrol measures can be adopted to check disease out break. 3. If biocontrol agents are applied avoid drenching with 0 .2% copper oxychloride.